A striking perennial plant from the iris family. When mature, Blue Sceptre grows in thick clumps with leaves up to 1.5m tall. Each clump produces 8 or more flowering stems in summer, with each stem containing hundreds of electric blue flowers, opening a few at a time. The flowering stems remain attractive in winter when dried out. This is a half-hardy plant originating from the Western Cape in South Africa, needing protection from hard frosts. So best to lift and protect in the winter in the UK or grow in pots which can be moved. Pack of 10 seeds. Sow in spring to autumn. Plants flower from the third season. Sowing instructions and a colour photo are printed on the packet. Conditions Most conditions in sun to part shade, and well drained but not too dry soil, protected from hard frost. 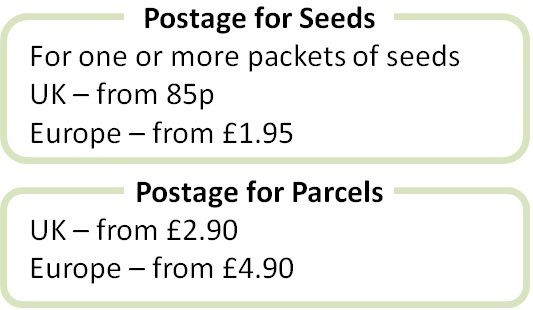 Sow in spring to autumn in well drained seed compost. Cover lightly with soil. Germination takes 3-5 weeks at 15-18°C. Transplant into pots when seedlings can be handled. Keep in a sunny position in rich well drained soil. Protect against frost in winter. Flowering starts from about the third season. These are evergreen plants and need little care other than removing untidy leaves and cutting back flower stalks once they have died down. In colder areas, the rhizomes can be lifted in autumn, but do not let the rhizomes dry out. These are not small plants, so it may be easier to grow in pots as an alternative to lifting.